Can't wait for the prince to come to SG again!!! saw the vids at the airport. the security was harsh cos the fans are crowding him. it is to protect Min Ho in a way. the crowd was crazy from the vids i saw. Yup it was totally madness! The security made an agreement with the fans to stand in a straight line so he'll ask MH to walk slowly so everyone can take pictures. But the moment the door opened, all the fans standing in front screamed and rushed out, throwing gifts at him at the same time. Tried to snap a picture of him but it was so blur because of the security standing in front, back, his left and right side. But nevertheless, he kept waving and smiling and turned back after he checked in. Thanks for all the comments for the vidz n pixs.. i really dun tink my pixs r good >_<.. though i didnt chase like some fans, i m still so exhausted.. hahaha will upload the clips i took earlier today tomorrow.. too tired.. old age catching up..
That's true yon! This is a lesson learnt for me. Shall wait at the door straight next time. Goshhhh can't wait for him to be back again. Hopefullu early next year. 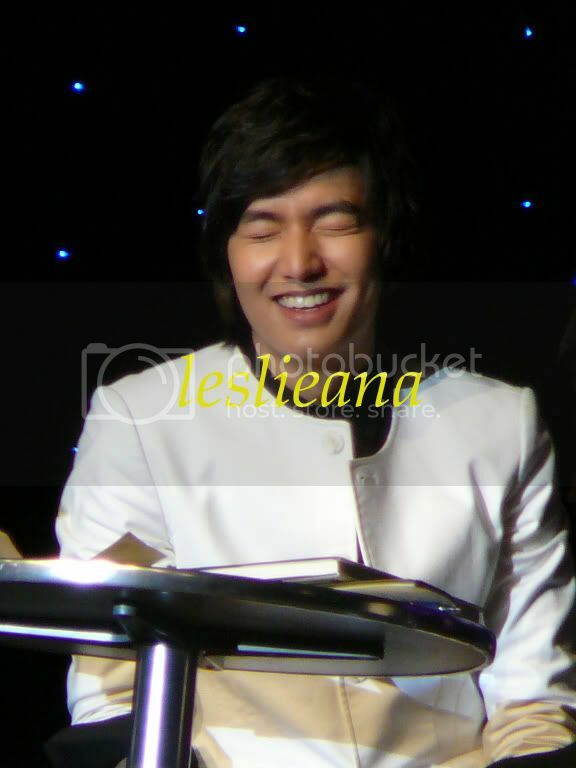 LMH is soooo cute. I think he went to straighten his hair today? Cos his hair didn't look the same as yesterday during the fan meeting. Haha it was kind of flattened today but still as handsome! ^I think his hair is naturally straight. They just 'temporaily permed' his hair yesterday for the event. I like this natural look (no wax, no gel, no perm) but it makes him looks younger and this nuna here perfers him to look more mature (aka GJP style or yesterday style) to match me. hahahah!!! Anyway, I’m repeating this for the 3rd consecutive day... Minho really looks good in real life! Too bad I couldn’t get a good video/pic of him at the airport earlier on (though I think he looked better with naked eyes than thru the camera screen). Hope someone did and share them here. Sharing the link is fine but please do not d/l the file and repost to elsewhere. Thanks! 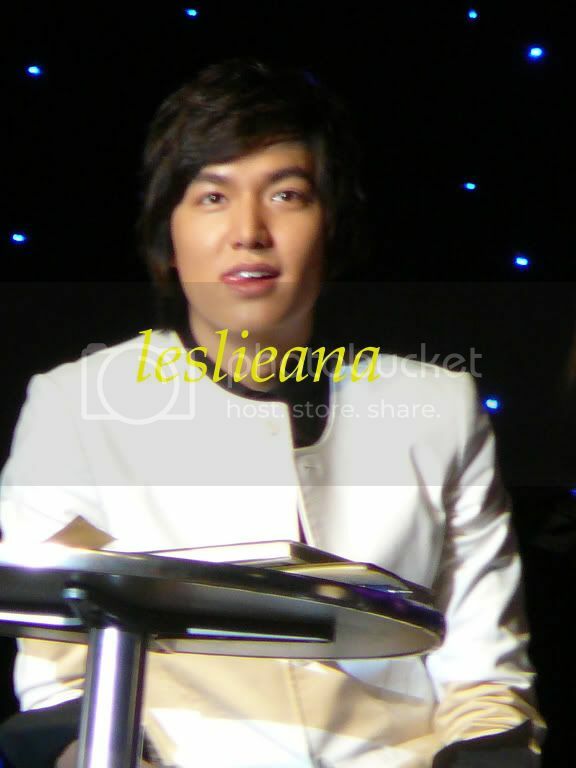 Ok, here’s my last instalment of the photos of the fanmeet. 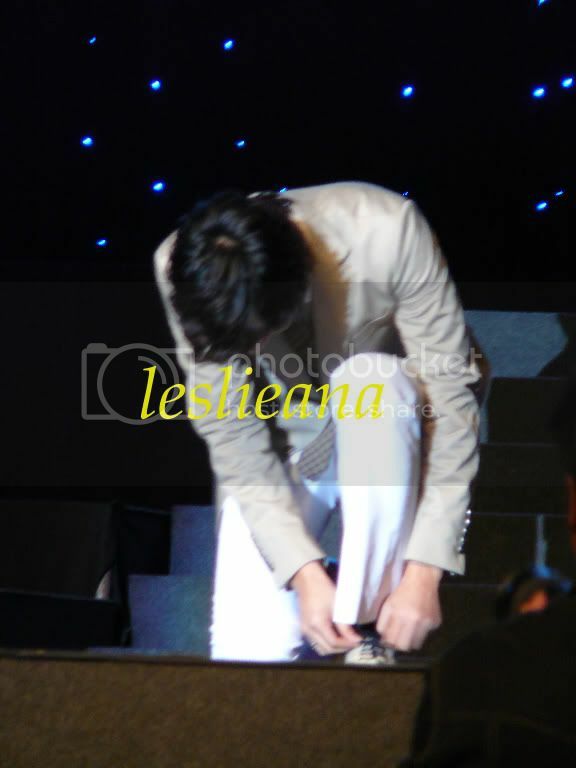 And let’s show off his display of his second image tonight with... wait, let him tie his shoelace first. Like everyone, I love the telephone segment. English translation of his letter. Mr Bodyguard is a bit unhappy to see his charge not at a handshake distance away from the lucky fans. But his charge is ever so obliging to all the requests from the fans. Will b back later w the airport clip.. for now.. zzz time! there is an article in Singapore Straits Times today regarding Min Ho's 1st fans meeting..
P.S. did anyone of you took a look at the poster given for $188 ticket... i thought it was the same pic as the advertisement on unusual website/tv,etc... but it turned out to be different and he looks really handsome...!! In the entertainment industry, the end of a year is a season about watching and talking about "people". Many media outlets select their "person of the year" and people flock to year-end awards shows to hear a quote from stars that they do not get to see often. <10Asia> picked our own figures of the year, but there is no red carpet or photo spotlights for the stars to enter upon. Our selection of "persons of 2009" are not top stars who attained the most popularity from the public, but people who changed the landscape of Korea's entertainment industry and stimulated the public with experiences that we had not had before. Here are ten people who showed us a new direction for upcoming 2010. "Now is the era of Mi-shil". Mi-shil's statement in the first episode of MBC's "Queen Seon-deok" opened "the era of Ko Hyun-joung" as well. Ko said that she chose the role of Mi-shil because she "wanted to escape the arrows flying at the lead character", but the powerfully charismatic Mi-shil will be remembered as one of the most memorable characters in the history of Korean traditional dramas. And it was the perfect opportunity for Ko to break out her acting skills that she had kept repressed all these years and with this drama, she proclaimed to the world that she had "really made a comeback" since returning to the industry in 2004. Her film "Actresses", which opened in December, offers a look into the personal life and inner side of this extraordinary actress, but after everything that she has gone through, Ko proved one thing and one thing only; for an actor, acting is what matters. Kang Ho-dong, the MC and leader of KBS's variety program "One Night Two Days", calls him "Sir Kim". This symbolically shows that producer Kim C holds a unique and unprecedented position in Korean variety shows. He is truly a "one of a kind loner" who cannot be allured into the world of Kang Ho-dong, who is known for leading other members with his charisma. He is so unfazed by set-ups and ratings that people sometimes accuse of him of not trying hard enough, but that is what makes "One Night Two Days" so real and lively and what made the KBS show "Invincible Baseball Team", where he was recruited as coach, into a baseball variety program. The more he cursed and shouted at the players on the show, the more it helped in making the show real. It is ironic that he became the most essential figure on the two most prominent variety shows of 2009 by breaking free from the conventional rules of television. The current trend in Korean variety shows regards pre-established direction and set-ups as corny, so his seemingly unimpressed expressions and honest dialogue may serve as the best blue chip. Director Kim Byung-wook can put together melodrama and black comedy through the story of one family and cover various topics ranging from modern Korean families to politics, economy and class. Such feat is a new ground that had not been seen in a sitcom and drama, and is also the essence of Kim that sums of all of his filmography. Thus, it is meaningless to categorize director Kim Byung-wook as a "sitcom director". Through "High Kick 2", he himself became a unique genre of his own. Kim Yuna makes the list again in 2009. Since some time ago, Kim Yuna became a fixture on the list of most prominent figures of the year. This is not due to inertia. In fact, when she lighted up the year of 2008 with her "Danse Macabre" routine, it was hard to anticipate that this excellent figure skater would do anything more because she had already reached another level. But Bond girl Kim Yuna, with her new "007 James Bond Medley" routine, showed fans that she could do even more. She became the first female single skater to breach the 200-point mark and the viewership rating for her competition reached 25 percent which is higher than ratings for popular weekend drama "Three Brothers" (KBS). 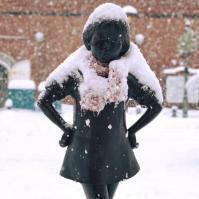 But even those remarkable facts do not do justice to the artistic achievements that she has shown on the ice. The real opponent of this young skater may be the history of figure skating, not Asada Mao or Joannie Rochette. This year, Korean real variety shows made quite an accomplishment in terms of both quality and quantity. MBC's "Infinite Challenge" may be the oldest among all the shows but it is still the most refreshing real variety show. The "Pimple Break" segment, where the cast were placed under control like actors within a given scenario, was a discovery of a new genre that was neither a movie or real variety show. There were even new, long-term suggestions for the variety show's production systems, such as producing yearly calendars. And at the center of it stands producer Kim Tae-ho. If writers are the new powerful forces in variety shows, then producer Kim Tae-ho would be at the top of the list. 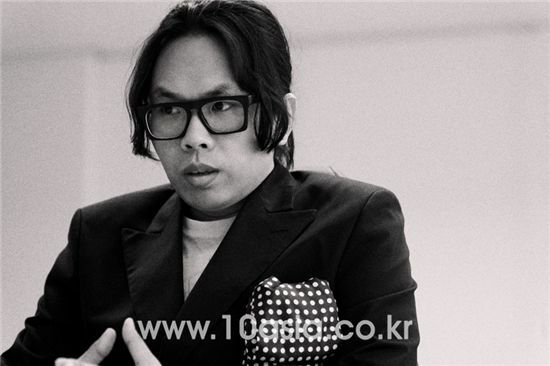 He produced KBS TV series "Boys Over Flowers" and MBC's "Tamra, The Island". The simple fact that Song produced a hit drama, a controversial drama, well-made and badly-made dramas and one that was cut short all within a year makes him interesting. Just like his unique career -- he started as a music director and then an actor before he turned producer -- he continuously succeeded and failed through a series of attempts that no one had ever tried before, such as discovering comic book sources, starting pre-productions of dramas and hiring unknown actors. It is still unclear if he -- who is planning to make dramas based on [comic book author] Lee Hyun-se's golf comic "Birdie" and Japan's boy-meets-girl story "Foolish Kiss" plus a musical version of [Korean hit TV series] "Goong" -- will see huge success next year. What is clear, however, is that there are very few producers in Korea who have such artistic vision. At the start of the year, Korea welcomed a new kind of pretty boy. 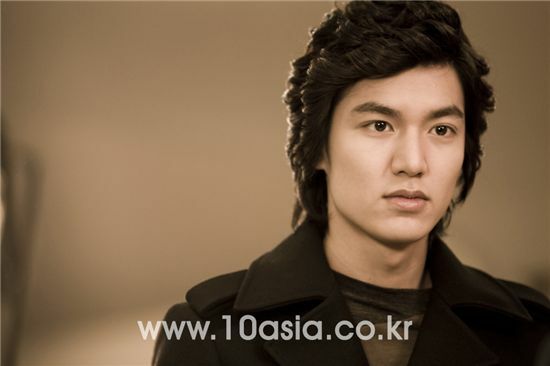 The character Gu Jun-pyo in KBS TV series "Boys Over Flowers", who looks like an exquisite mixture of Julian the Apostate and [legendary Korean singer] Na Hoon-ah, captured the hearts of numerous females with his immature behavior and aggressive style of dating. And new actor Lee Min-ho, who debuted four years ago, instantly became a star with the most passionate group of fans. Thanks to the newfound popularity, cable channels started showing [Lee's unknown film] "Our School ET" and the Internet started to become flooded with scenes from [his previous dramas] "Secret Campus"(EBS, 2006) and "Mackerel Run" (SBS, 2007). It is disappointing that he followed up his brilliant success with donut commercials [for Dunkin Donuts Korea] and Southeast Asia tours [for fan meetings], but a volcano is set to explode once it has been awoken. And since he has announced that he will start working again, the volcanic eruption of Lee Min-ho seems not too far away. There are many stars but not all prove to have star quality. The reason Lee Byung-hun became a prominent entertainer in 2009 was not only because he participated in huge projects but also because he has proven to possess that abstract but influential thing called star quality. When he appeared in the Hollywood blockbuster "G.I. Joe", he made villain Storm Shadow the most fascinating character in the film and he easily made his presence known as the big star of the host country, leading VIP co-stars Josh Hartnett and Kimura Takuya from "I Come With The Rain" to the 14th Pusan International Film Festival. On top of all that, the end-of-year commercial success of KBS drama "Iris" marked the finishing touch on Lee's acting work this year. Compared to all the other so-called blockbuster dramas such as SBS's "Cain and Abel" and "Swallow The Sun" which were unable to draw much attention from the Korean public, "Iris" scored viewership rating over 30 percent and stood at the center of the spotlight. This is what it means to be of different class. Once a good boy, always a good boy. 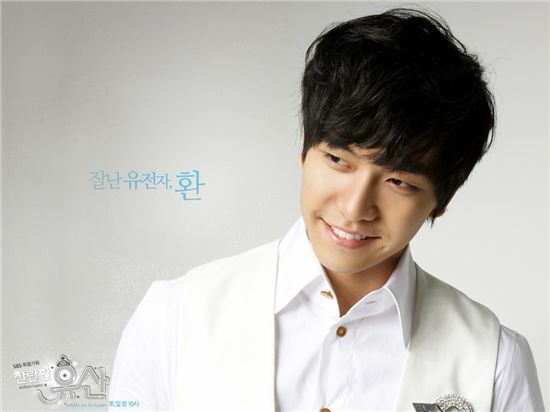 Lee Seung-gi, who not only works hard but excels in what he does, received excellent grades on his report card as an all-around entertainer as singer, actor and variety show regular. In the popular KBS variety show "One Night Two Days", his character became a source of good humor on the show and his star turn in SBS drama "Shining Inheritance" helped score a 40-percent-plus viewership rating. One Saturday when the combined ratings of Lee's two shows added up to 70 percent, the country started calling him "The 100 percent man (in terms of viewership rating)". He became the consumers' favorite star for commercials because he does not even have any anti-fans. He is liked by all age groups; for elementary school kids, he is the friendly boy-next-door; to young fans around his own age, he is the good, average "son of mom's friend"; and older fans see him as the flawless, model celebrity. From a scale of one to ten, this was a 100-point year for Lee. In an interview with <10Asia>, music producer Teddy explained what producing means in the K-pop scene these days -- "everything from music to styling". And he showed us what he meant by introducing girl group 2NE1, who had integrated music, fashion and music video as a group and whose character was defined by such integration. 2NE1 is the best example of how important it is to combine visual style with music that was pre-conceived and produced under a certain concept. 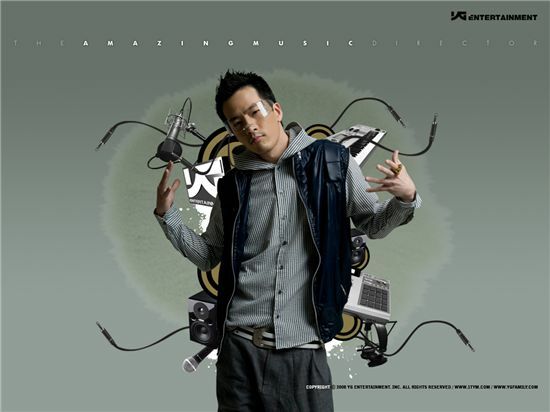 This year, Teddy was the "trendsetter" amongst all the prominent songwriters and producers in Korea. Sharing some of the pictures of the Fanmeet. Sorry for the picture spam. Casting a last look at his adoring fans before making his final exit to the backstage. This is also the very last picture I have of him on my cam's SD card. 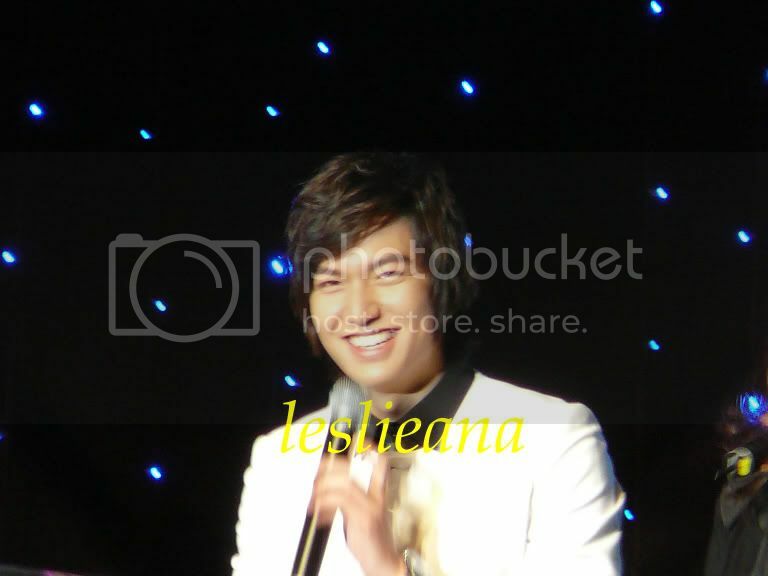 thank you to rgal, and all minoz sg who already shared their photos & vids of minho in FM. beautiful photos of Minho! maymay, glad you back home safe & 2 atminho back home with minho safe too. miss you, jelita and 2 atminho also. they so cute and kind. so happy for this trip. Oh, I did not even realize the poster they gave to the $188 ticket holders is different from the one they gave to those who exchanged it with the ping pong ball. I happened to open the latter one and thought the other poster should be the same. Thanks for the heads-up! Good to hear that he finally got a chance to eat the chilli crab. Any insider info on how he finds the taste? Oh, and deka_if, thanks for sharing the article on the “Top 10 People of 2009”. I’m for sure am looking forward to that ‘volcanic eruption of Lee Min-ho’ in 2010.
meukowz, those are very clear pics that you have taken!